For Spring Rolls: Toss together the lobster meat, cabbage, green onions and hoisin sauce. Divide into long mounds across the diagonal of the wrappers leaving enough space at each end of wrap to fold over the filling to enclose tightly when rolled up. Wet the edges of the wrapper and fold the short ends over the filling. Roll the wrapper from the bottom to enclose the filling completely and tightly. The water will act like glue to seal the edges. Deep fry the spring rolls in 360°F (182.2°C) oil. As you remove them from the oil, drain quickly on paper towel and then dust with the sesame seeds. 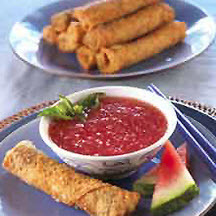 For Watermelon Sweet Sour Sauce: Mix ingredients together and serve as a dipping sauce for the spring rolls.